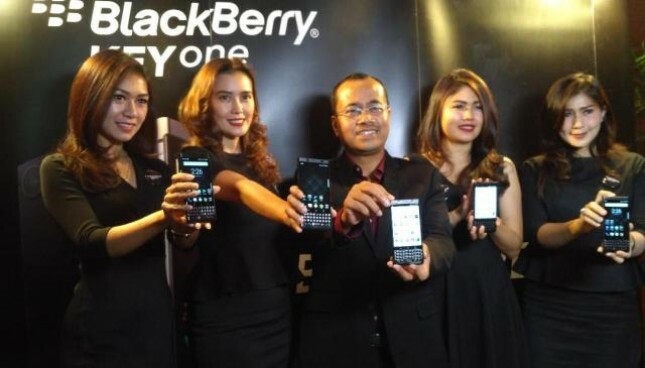 INDUSTRY.co.id - Jakarta - PT Blackberry Merah Putih, Blackberry licensee in Indonesia officially launched its latest smartphone that is Blackberry KEYone Limited Edition Black for people in Indonesia. Blackberry KEYone is the first Android-based smartphone from Blackberry that uses QWERTY keyboard for the market in Indonesia. "We are sure Blackberry is still in the heart of the people of Indonesia, and still trusted all the distribution channels," said Sukaca Purwokardjono, Chief Operating Officer of BB Red and White in launch BB KeYone Limited Black Edition at XXI Plaza Senayan, Thursday (23/11/2017). Carrying Android 7.1 Nougat and equipped with Blackberry Hub and Blackberry DTEK mainstay feature, Blackberry Keyone is expected to meet the expectations of smartphone users who rely on speed, convenience and data security. "For market penetration, we optmialkan through 500 offline stores and holding thirteen leading online store in Indonesia. For Blackberry Keyone will be produced as many as 2,000 units," he concluded. The phone looks elegant with black and silver metal edges. BlackBerry KeyOne has a 4.5-inch landscape screen with capacitive buttons back, home, and recent apps. At the bottom of the screen, there is a typical BlackBerry QWERTY physical keyboard. The top of the screen there is an 8MP resolution front camera. In addition, there are speakers to listen to calls. On the back side, there is a BlackBerry logo. When viewed through a snapshot, KeyOne rear casing does not have a fine texture. This is probably meant that the phone is not slippery and more comfortable grip. The back of the smartphone also has a main camera with 12MP resolution complete with dual flash. Meanwhile, the right side of the smartphone displays the volume button and the lock button. The upper part there is a SIM card port that can be opened with a SIM card ejector. The right side of BlackBerry KeyOne is the volume and SIM card port. Turning to the top side, BlackBerry still put a jack for the headset on the right side. Meanwhile, for charging ports, BlackBerry presents USB Type C at the bottom. This device is priced at Rp 8.999.000 and pre-orders are available starting on 16 -26 November 2017. Various interesting offers, ranging from Cashback, 0% installment to bundling of data packets given during pre-order.